Date: Wednesday, 29th November 1967. Venue: Stadion Partizana, Belgrade, Serbia, Yugoslavia. Competition: Inter-Cities Fairs Second Round, First Leg. Scorers: Partizan Belgrade: Paunovic. Leeds United: Lorimer, Belfitt. 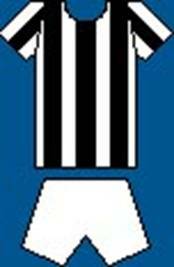 Partizan Belgrade: Curkovic; Radakovic, Damjanoic; Djrdjevic (Vukelic), Paunovic, Mihailovic; Bajic, Pekazi, Hasanajic, Hosic, Prmajer. 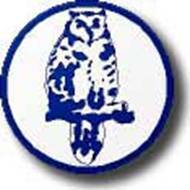 Leeds United: Harvey; Reaney, Cooper; Bremner, Charlton, Hunter; Greenhoff, Lorimer, Madeley, Belfitt, E. Gray (Bates). If United had had it easy in the first round, they certainly were up against it in the Second Round where their opposition was provided by Partizan Belgrade, who were running second in a very strong Yugoslav league and conquerors of Manchester United in the 1965-66 European Cup Semi-Final before losing narrowly 2-1 to Real Madrid in the Final. Manchester had been widely tipped to win the European Cup that year and had over-run the Serbians in the first half in Belgrade, but the home team scored just before the break. They then came out in the second half and showed United little respect to double their lead before going on to beat them at Old Trafford by the single goal. Brilliant Welsh International keeper Gary Sprake had been declared unfit and the young David Harvey stood in magnificently against the fierce Yugoslav attacking play and the 2-1 victory sent a ripple of surprised applause across football Europe. On top of lacking the services of their first choice keeper they were also without Mick Jones their new English International centre-forward with an ankle injury, so the victory was indeed honourable. Manager Revie called it ‘our finest performance in Europe’. On the bright side Jack Charlton had passed a fitness test on the day of the match and played a crucial role in United’s second goal. The goals came from Peter Lorimer in the twenty-fourth minute and Rod Belfitt made it 2-0 eight minutes into the second half, while Paunovic pulled one back for the home team with three minutes left on the clock. 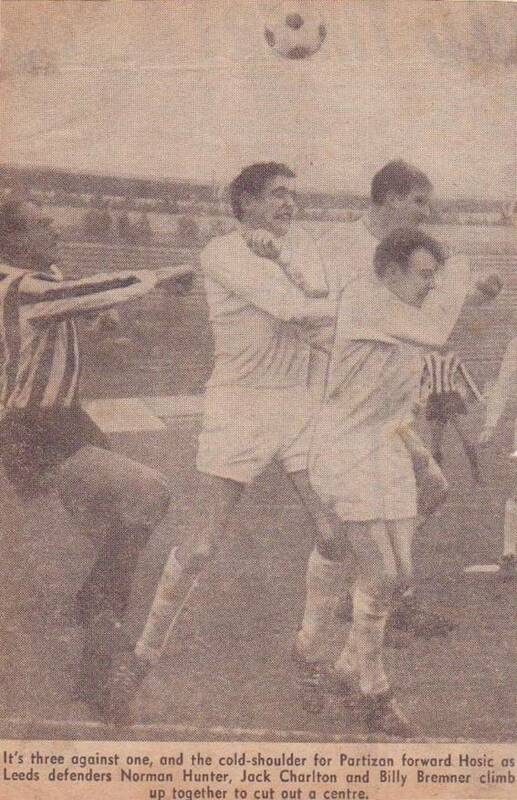 United were well aware of Partizan’s tactics and had no intentions of falling for the sucker punch as their Lancastrian foes had done. Every Leeds player was under orders, as he was in every match, to work and run, graft and run and put 100% effort into everything. 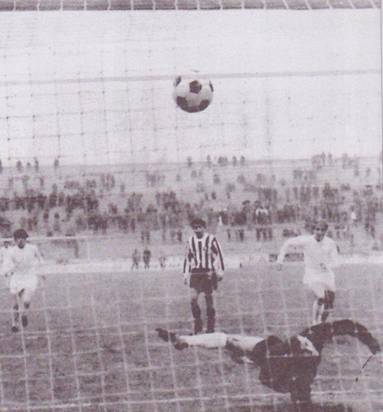 So they chased and harried and never gave Partizan time to breathe, finishing up scoring a couple and conceding just one. Partizan were a good team, and gave as good as they got but they just couldn’t match Leeds for pace, punch and staying power. The game itself was one of United’s fiercest encounters since they had started their European travels. United had built up a reputation as a tough and uncompromising team, but even their physical strength was put to the test in Belgrade. Partizan defender Milan Vukelic had been sent off the previous weekend and started the game on the substitute’s bench but by the time he had replaced the injured Boroa Djordjevic after twenty-seven minutes, Leeds were already ahead. Eddie Gray had been hacked down and Peter Lorimer blasted the free-kick into the net from twenty-five yards after twenty-four minutes. 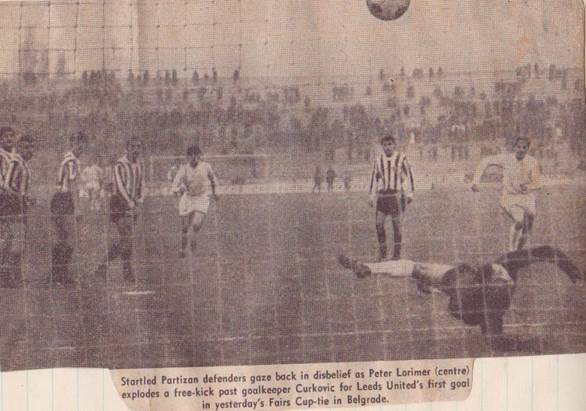 Two minutes later David Harvey showed his ability when Josip Pirajer tried to repeat Lorimer’s feat for the home team but was kept out by a superb diving save from Sprake’s deputy. United’s second goal came in the fifty-third minute as Jack Charlton rose high to head the ball against a post from a corner and Rod Belfitt was on hand to net the rebound. United were looking comfortable when the trouble that had been simmering all match suddenly exploded with seven minutes left on the clock, when Leeds substitute, Mick Bates, and Milan Damjanovic clashed. There was a quick exchange of kicks and Mick Bates was sent off. Partizan immediately sensed that they could get something out of the game and swept forward forcing David Harvey r to firstly tip away a Ljuan Prekasi shot before immediately to hold on to a Idriz Hosic header. The pressure finally told with just three minutes left when Blogoje Paunovic headed in to keep the tie alive, but United saw out time to record a fine victory. It had rained heavily on the day of the match, and had turned bitterly cold. Next day it turned to snow as United flew out, the Yugoslav winter began and there was a disastrous earthquake at Skopje, not so very far from Belgrade.